A impromptu short story completed for my creative writing class, where I partnered with avid writer Becca Lynn. Our prompt was on a relationship, with the incorporation of a goldfish somewhere in the story. John and I never seemed like a couple that would break up over something so trivial. One day, I just couldn’t take it anymore. I had to leave him. I had to get out. He came home from work one day, and I don’t know…I lost it. “I hate its bulging eyes and its white flecked scales and the round bowl that you have it in. It’s so oddly placed on that dresser, look at it…next to your dying plant that you refuse to water,” I paused, taking in the deer-in-the-headlights look on his face. I continued my rant, watching him set down his briefcase and take a step back. Was he afraid of me? My voice echoed in our apartment. Thank goodness the window was closed. I’m sure the neighbors would be scared to hear such a fight from what they thought was a forever-in-love couple. They didn’t know about the fish. I heard what he said but I didn’t care. I kept thinking about the fish, glancing over to the bowl with a sick feeling in my stomach. It’s not the fish, although, it was a little. The fish is just simple and boring. I don’t see a point in something that swims around, never changing its path, always remaining a sad, little orange creature that lives in a comfortable home on top of a comfortable dresser. But he loved that fish. I could tell he was about to cry, or tell me why the fish meant something to him. He took a step closer to me, his eyes glazing over and his eyebrows quivering up and down in confusion. He kept looking at me in those wide eyes, searching for any ounce of sympathy that I wasn’t willing to give him. He was running out of breath but didn’t give up. I looked down at the floor and took a deep breath. I knew this wasn’t going to be easy. “John, I can’t remain in a place created upon routine, each day the same thing,” I saw his mouth quiver. “You bet I don’t take care of that thing!” I interrupted, shouting a little louder than I intended. He stood waiting for me to say something, probably hoping I wouldn’t go on about the fish. I had to continue. I sat on the bed, looking away from the fish and John’s face as he desperately searched for air. Like a fish, I thought. I stood up and walked toward the window, my back is again to the fish, and to John. I stared out the window and wished to say something else but I was lost. I was swimming in my own pool of frustration. I tried to understand what he was saying, but I only hated him more. I walked to the door and saw him hold out his hand. 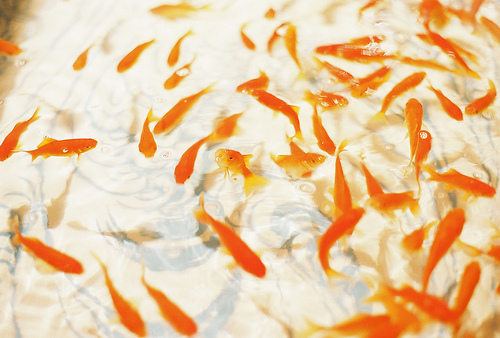 “I never wanted the life of a goldfish,” I whisper, and I was gone. Good story! I’m glad it wasn’t the story about you yakking from bad Salmon. Thanks! I don’t think WordPress could handle a story about food poisoning. Blech. I love this. Quirky, goofy, and a great metaphor. Well done! Thanks! Becca and I had similar thoughts for a breakup idea, and we wanted it to be over the goldfish, which is kind of a funny way to break up! Thanks as always for reading! Enter your email address to follow this blog and receive notifications of new posts by email. You will make the blogger very happy if you decide to follow her.